Heat gas or charcoal grill. In food processor, place cilantro, onion, garlic, chile, lime juice, oil and 1/4 teaspoon of the salt. Cover; process until finely chopped. Blend in 2 to 3 teaspoons water to make sauce thinner, if desired. Transfer to small bowl; set aside until serving time. In small bowl, combine cumin, pepper and remaining 1 teaspoon salt; rub evenly over steaks. Place steaks on grill over medium heat. Cover grill; cook 7 to 10 minutes for medium-rare (145°F), turning once halfway through cooking. 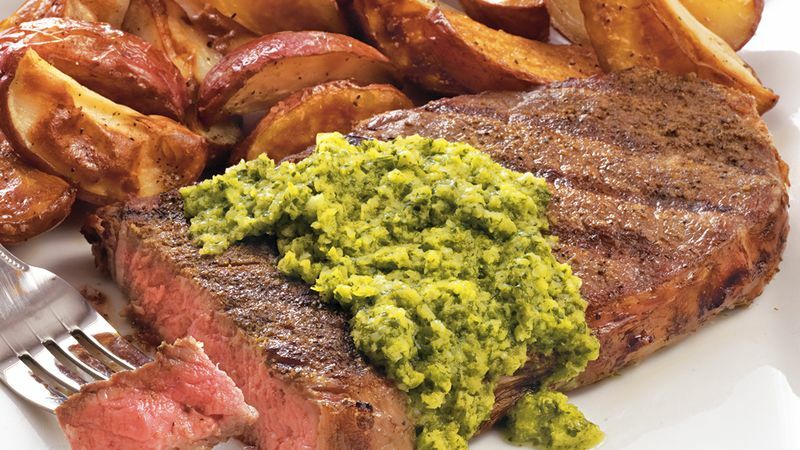 Serve 2 tablespoons chimichurri over each steak. For freshest flavor, purchase whole cumin seed and grind in a mortar and pestle or spice grinder just before using. Substitute a serrano chile for the jalapeño or add a pinch of ground red pepper (cayenne) if chiles are not available.